Financial Services Firms Face Further Scrutiny of Their Cybersecurity Practices: Is Your Firm Ready? On September 15, 2015, the SEC issued a new Risk Alert on cybersecurity that registered broker-dealers and investment advisors need to review closely. As part of the September Alert, OCIE announced it will issue a new round of examinations and review a larger number of areas. Firms should not be surprised given OCIE’s first round yielded numerous gaps in cybersecurity readiness. 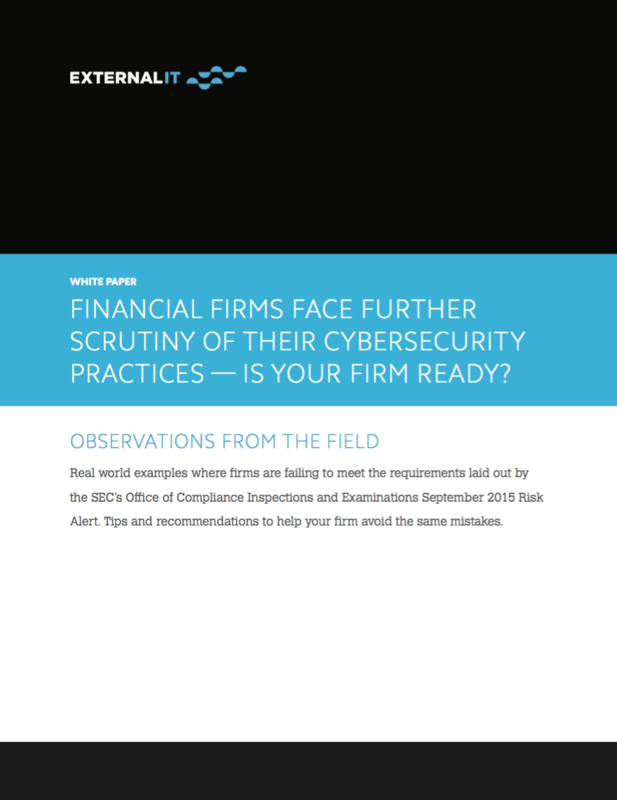 With cybersecurity a top priority at many financial firms, External IT has put together this whitepaper to help guide you through OCIE's new examinations. As an IT outsourcing firm who specializes in the financial services industry—and provided security assessments to the wealth management industry for years—External IT has first-hand knowledge of how firms are handling cybersecurity. In this detailed response we break down all six areas areas of review using real world examples and provide recommendations to take practical steps towards managing your security and compliance programs.